Local marketing budgets, from market development funds (MDF), co-op budgets, product advisory councils and more, are key to providing sales channels with the resources they need to launch and support marketing campaigns. Simplify and streamline the allocation and management of marketing budgets to turn your company’s investment into real sales that boost your brand’s bottom line. Download our one-page tip sheet for simple ideas on how you can easily encourage sales teams to better leverage marketing budgets. 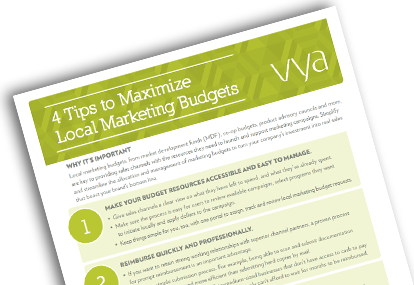 At Vya, we’re proud to work with clients every day to help them gain control of important local marketing budgets. We’ve developed budget management tools that work – giving you an easy way to track, manage, allocate, review and approve requests all with one web-based tool.